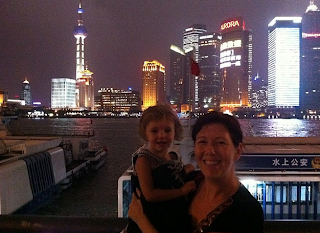 Thoughts From An Expat Mom: Time Flies When You're...Super Busy and Stressed! Time Flies When You're...Super Busy and Stressed! Good lord, things have been CRAZY busy in our house this month...well, more like crazy AND busy! OK, more crazy than...well, you know. Anyway, what have I been up to since the last time we spoke? 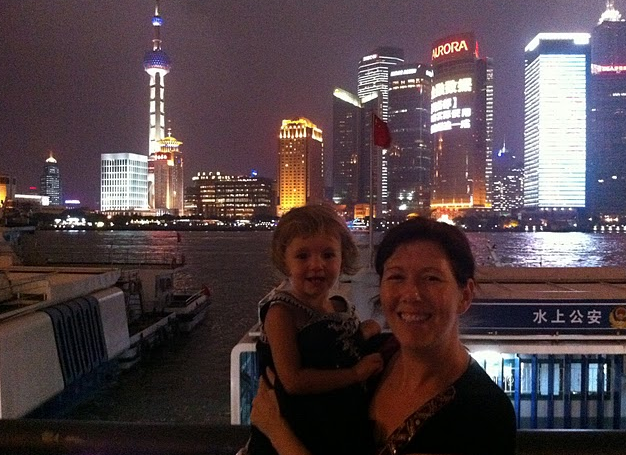 Well, I have been spent two weeks on my own with the kids, and spent a week in Shanghai with the family and my parents for a training workshop. They had a great time, while Jabiz and I spent 3 days talking about unit planning and criterion-based assessments. During all of this bonding and travel time, I have learned many important life lessons, which I will happily pass along to you now. You're welcome! Lesson #1: You actually CAN alienate an entire plane full of people before the last passengers have boarded. 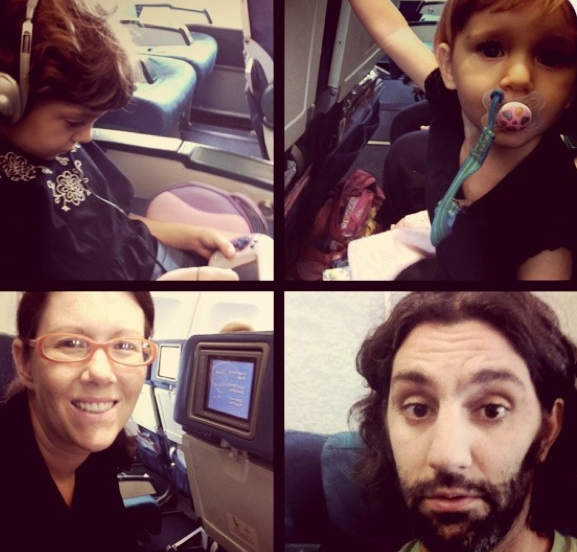 This lesson was learned on our flight from Shanghai to Hong Kong, when Skye misunderstood my refusal to let her play with my phone ( as per FAA regulations) as complete mental and emotional trauma, and spent the 15 minutes between finding our seats and waiting for takeoff screaming on the floor. Everyone within 20 rows of us was exchanging nervous looks, clearly thinking, "Oh, god, THAT'S the kid who is going to ruin our flight!" Luckily, she wore herself out in time for takeoff, and fell asleep soon after. So take THAT, everyone within 20 rows of us. That's right. Lesson #2: Kids really, truly DO save their worst behavior for their parents. It's like the extra added bonus of parenthood. I learned this lesson after spending three days worrying that my parents would have a difficult time handling the frequent and inevitable tantrums that I was sure Skye would throw at least a dozen times a day while my parents were taking care of the kids during our workshops. And everyday- EVERY. DAMN. DAY- I would go to their hotel room to pick up the kids and be told how wonderfully they behaved. No tantrums, they would tell me. None at all. This would be followed, of course, by a series of shrill screams once Skye realized that the parents were back, and thus the tantrums could now begin! And begin they did. Oh yes, they did. Sigh. Lesson #3: When you have kids, a new restaurant in the mall is the greatest thing ever. No, no, maybe you don't understand- EVER! A new Italian restaurant finally opened up in the mall near our house, and I swear to you, it has changed our lives! And yes, you did hear me correctly- a restaurant IN A MALL. If you had told me when I was in my 20s and living in New York City, eating fabulous 2-hour meals in trendy restaurants every weekend with friends, that someday I would see a new restaurant in a mall and start drooling, I would have simply ignored you and your crazy, crazy statement. Because everyone knows that you don't respond to or provoke the insane. But, whatever. There's a new restaurant, it's in a mall, and it serves ITALIAN food! That is a bit of a novelty here in my part of Jakarta. Yes, they have the typical takeaway pizza chains, like Dominoes and Pizza Hut, but no good Italian restaurants. Italian restaurants mean pizza. They mean pasta. These are things THAT MY KIDS WILL ACTUALLY EAT, ya'll! It also serves fancy salads, and things like pumpkin risotto with gorgonzola sauce. Which means that we can go out for a meal and everyone is happy with the food- everyone! I should also mention here that it also serves wine. Cheap wine. This may not be such a big deal to many of you, but when you live in a muslim country, a restaurant that has good food AND cheap wine is made of gold, or should at least be treated thusly. This restaurant has been open for about a month, and already the wait staff recognizes us when we walk in. About 3 times a week. Minimum. Lesson #4- Chinese people love themselves some little blond Western kids. If you had been in our vicinity as we walked around Shanghai, you might have mistakenly thought that Brangelina was in town. Nope, that was just us, surrounded by groups of Chinese people waving camera and phones around, trying to get pictures of our kids. It's happened to us before in Asia, having strangers come up and take pictures of our kids, but not in such large crowds as in Shanghai. There is something flattering yet slightly creepy about seeing entire families pose one by one with your kids. Some even tried to pick up Skye, until she unleashed her Inner Demon that she usually saves just for us and wailed at the top of her lungs. They were quite the hit, though Skye has more of a penchant for it than Kaia does. She would walk by, waving at people and calling out greetings, while Kaia would stay by my side, clutching onto my leg. The crowds would usually disperse after five minutes or so, at times to be replaced by others. I should move them to China and have them become Supermodels, because right now that's the only way in hell we are going to pay for college. Lesson #5: As soon as my husband comes back from one trip, there is a very, very good chance he will turn around and leave again, just as I've gotten used to being in a two-parent household again. This past week, Jabiz had to go out of town AGAIN, this time with the grade 9 students on the Week Without Walls trip that the entire middle and high school went on. I stayed home with the grade 6 students, who hung around school for a few days. Which was awesome, because it meant that I got to be at school all day with the students, then go home at 4:00 to feed my kids and put them to bed, and then rush back to the school for the evening activities until 10:00. This? Was not so easy. This was much harder than when Jabiz usually goes out of town, and we have a normal routine. This was like Single Momdom Plus. And yes, I know that many single moms work more than one jobs and have those days on a regular basis. And yes, I have respect for them tenfold. Hundredfold. Infinityfold. Lesson #6: One phone call can make you feel like the worst mother in the world. So, going back to these class trips, Jabiz was in the jungle with his students and therefore unable to call or Skype us all week. You can imagine how well that went over with the kids. Because if there is one thing that we can always count on with them, it is that whichever parent is not around is the ONLY parent that they want. At least they are consistent with that. Anyway, by Wednesday, Kaia was getting whiny and clingy and why wasn't daddy calling?? Why wasn't he Skyping us like he usually did? I tried my best to explain, but Kaia is only five, so her understanding of technology and satellites and signals are a bit lacking. On Wednesday night, Kaia and I were in bed reading when my phone rang. It was my Assistant Principal, letting me know that she really needed me to email her something important straight away. Since I was the only teacher who stayed home from the class trip due to having children, I was the point person for handling any needs that came up. I told her that I would have it to her in 10 minutes. Obviously, as soon as I hung up, chaos ensued. Kaia thought that the phone call was Jabiz, so when I hung up and she realized that it wasn't, there was a meltdown of nuclear proportions. She was lying in bed screaming and crying, "Daddy! I want my daddy!" while I frantically tried to find the document to send to my AP. "Kaia, "I called out, "I'll come in and talk to you about this in a few minutes, but I just really, really have to get this done first!" I don't think anyone will be surprised to hear at this point that our super-slow internet was even slower than usual that night, and NOTHING would send. From ANY of my four email accounts. Nothing. I cursed. I cursed some more. I had four different windows open with four different email accounts, pushing Send over and over with nothing but the frustration of watching the spinning wheel of death as a result. The screaming continued. The crying continued. The promising to come in as soon as I could get the damn document to send for god's sake continued. I finally turned off the modem and spent five agonizing minutes waiting for the yellow light to turn green, which it finally did. After a few more minutes, I got the document to send and was so busy throwing myself back onto the couch with a sigh of relief that I didn't notice that there was silence in the air. I went into the bedroom to talk to Kaia and calm her down and found her asleep. My daughter had cried herself to sleep. You could still see the tear marks on her face, and every few second she would catch her breath in her sleep. I honestly do not remember the last time that I felt so badly. One phone call, ONE, can make you feel like the world's most awful parent. And welcome to motherhood! Lesson #7- Moms just cannot rock the light pink ballet flats. I love shoes, especially ballet flat. I have long since given up on wearing heels or anything that I cannot stand in for long periods of time. I know that there are plenty of Yummy Mummies out there who still manage to wear things like skirts and high heels and makeup, but I am just not one of them. And I am OK with that. But I do love ballet flats. I bought a new pair of light pink ones, delighting in how cute they look with green cargo pants AND dress pants. They are shiny and delicate-looking...or at least they WERE. Until I wore them around my children. My beautiful pink ballet flats are now sullied with little black footprints where my kids have stepped on them or stood on them. It took about two days. Fortunately, I wasn't surprised. Lesson #8: Husbands have no idea. I think that Jabiz has a vague notion of what it is like to stay home alone with the kids for a week, but you really can't know unless you are here. It's unfathomable, really. So, obviously, what happens whenever he goes out of town is that the kids get progressively clingy, whiny and generally out of sorts as the week goes on. And I mean MUCH more than usual. And obviously, I inform Jabiz of this every chance I get when he calls or Skypes. Every chance. I am not even embarrassed about that fact. I swear, he'll be telling me how tired he is from nonstop presenting and running a cohort for 10 hours a day, and I'm like, "Yeah, well, at least you aren't here taking care of our kids by YOURSELF!" I've mentioned before what an awesome wife I am, right? I'm pretty sure that I have. And OBVIOUSLY, as soon as he comes back, the kids are so, so happy to see him that they magically bounce back into their cheery-ish, normal selves, and he's all, "What do you mean, it's hard to be home alone with them? They're not that bad!" OK, well, there are still MORE life lessons that I've learned this month (wow, I hadn't realized what an educational month this has been! ), but I will continue them in Part 2, in order to spare you all another 30 minutes of reading. You're welcome. Tell me some life lessons that YOU have learned lately! Hello! Leigh Graves Wolf suggested I read your blog - - it was just what I needed tonight. My husband also travels frequently and just when I'm used to not having him around, he comes home, messes up the routine and then breezes out. I'm glad to know that even across the world there are moms who have crazy kids who only want daddy at exactly the worst moments, moms waiting patiently for FDA approved airplane sedatives for kids, moms who just. want. a. nap. Great post. Hang in there!